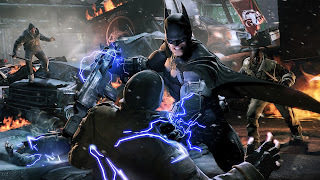 Batman looks to have fully found his place in the gaming world, with a successful run of titles from developer Rocksteady; we now see the latest entry in the series being delivered by a new team. I recently had the opportunity to sit in on a presentation of the upcoming game as well as the chance to put the DLC character, Deathstroke through his paces. So is this Batman as we've come to know it these last few years? To kick things off we were treated to a presentation showcasing one of Batman’s newest weapons, the Shock Gloves. As the name suggests, these gloves can deliver some pretty powerful punches to your enemies and send them for a loop or two, and can even do major damage against enemies with shields up. The amount of charge you had left was indicated with a battery icon in the top left corner, however the weapon can be recharged through the use of any electrical station you may find in the game. They can also be used to jump start mechanisms to open doors or activate elevators, and while it may not be a huge, game changing addition, it does enough to tweak and keep the gameplay fresh for long time fans. Batman looks to electrify his enemies. The next thing shown to us was the newly announced assassin, Firefly. So at this point, Batman was on a bridge that looked like it was about to completely fall apart and the goal here was to use whatever cover you could find within your environment and bide your time until the right moment comes to use your zipline to bring the assassin and the fight to the ground, and to a more even playing field. Of course, Firefly wouldn't make this easy as he’s constantly trying to barbeque you with the two flamethrowers he has equipped on his arms and any cover you try to hide in. Of course the bridge is surrounded by vehicles so the cars and trucks will explode should they catch fire. Lastly for the more hands on part, we were given the chance to use the Pre Order DLC character, Deathstroke and put him through his paces in a few mini games, to see how he differs to Batman. One of the games I played was called 100 to 1, where you would have 100 enemies come at you on screen and pretty much take them all down. The enemies vary in terms of difficulty so you won’t be facing the same crop throughout. Some will come completely bare handed; others will come with weapons to prove more of a challenge. As for Deathstroke himself, I couldn't really pick out anything that made his style of fighting different to Batman’s, but one thing that stood out to me was that his counters felt like it had a lot more impact to them, with the actual intent of killing his opponent compared to Batman’s swift yet quick counter attacks that look to simply immobilise. If there is one thing that made the Arkham City titles so good, is that the smooth transitions in combat between attacking, defending and countering made it an absolute joy to get into a fight with a bunch of convicts, and with 100 of them coming at you, it made you feel unstoppable as you try to attack them all while watching your own back and countering anyone that dared to take a cheap shot. 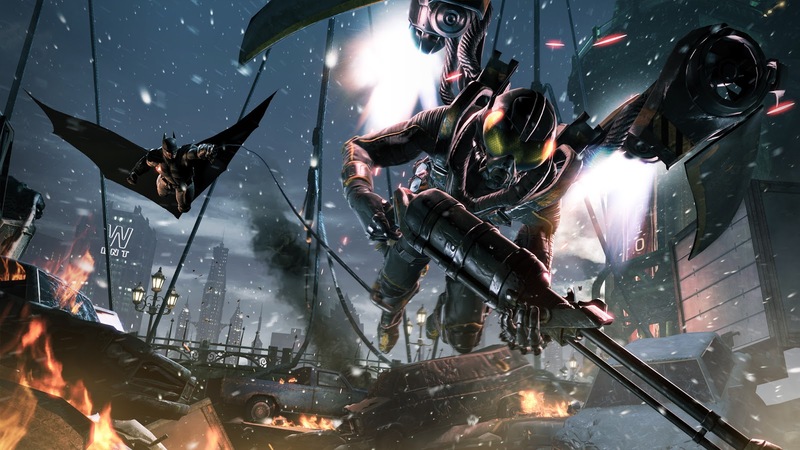 So far Warner Bros. Games Montreal look to be keeping most of what made the Arkham series great, while including their own ideas and mechanics which look to tweak the gameplay more rather than bring something innovative to the table. From the small section I demoed, it’s still too early to give a full judgment on the game, but as of right now, Warner Bros. Games Montreal has a lot of expectations to live up to, but things are definitely heading in the right direction and with not so widely talked about enemies headlining, it should make Batman: Arkham Origins one to look out for.